CLR Forum readers in New York City this summer should check out “Bellini, Titian, and Lotto,” currently on display at the Metropolitan Museum of Art. 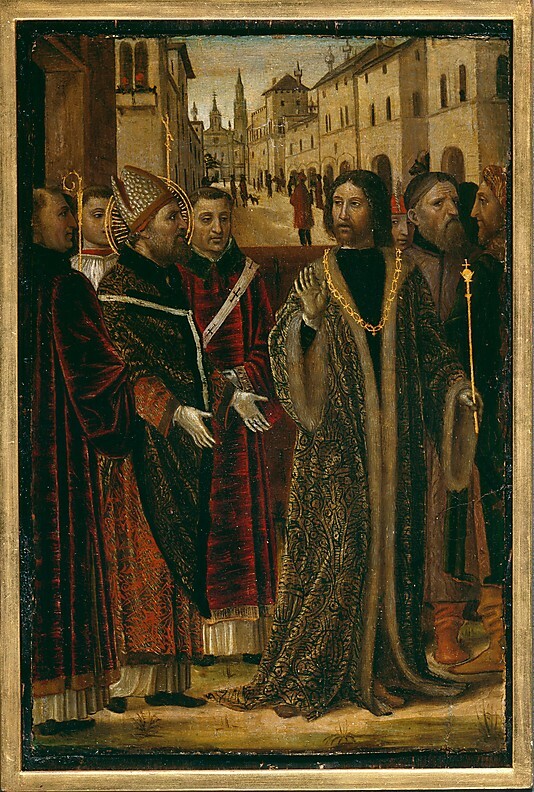 The whole exhibition is worthwhile, but church-and-state types will particularly enjoy an 15th century altarpiece, “Saint Ambrose and Emperor Theodosius I,” by Bergognone (left). The painting depicts one of the most important church-state confrontations in history. When Ambrose heard of this deplorable catastrophe, he went out to meet the Emperor, who—on his return to Milan—desired as usual to enter the holy church, but Ambrose prohibited his entrance, saying “You do not reflect, it seems, O Emperor, on the guilt you have incurred by that great massacre; but now that your fury is appeased, do you not perceive the enormity of your crime? You must not be dazzled by the splendor of the purple you wear, and be led to forget the weakness of the body which it clothes. Your subjects, O Emperor, are of the same nature as yourself, and not only so, but are likewise your fellow servants; for there is one Lord and Ruler of all, and He is the maker of all creatures, whether princes or people. How would you look upon the temple of the one Lord of all? How could you lift up in prayer hands steeped in the blood of so unjust a massacre? Depart then, and do not by a second crime add to the guilt of the first. Struggles between the Church and the Empire did not end in the fourth century, of course; indeed, they were just beginning. And this account does sound a bit tendentious. I imagine the Emperor (who, like Ambrose, is a saint, at least in the Orthodox tradition) had his own version of the story. But church-autonomy supporters have long argued that this episode shows that a distinction between church and state as institutions goes back to the very beginnings of Christian civilization in the West. And there it is, hanging in the Met. You see? Church and state issues really are everywhere. Wonderful post! I have a keen interest in the complex dynamic between Church and State during the period in question. More specifically, I am interested in the Church’s initial theological reaction(s) to the newly Christianized political ethos of the Roman State and the primacy of Athanasius (295-373) in inaugurating a theology of Church and State. Athanasius was the ecclesiastical leader first significantly exposed to the Christian renovation of the Roman state. Among other things, Athanasius strongly objected to the interference by Emperor Constantius (the second son of Constantine) in Church affairs. Constantius was keen on sustaining a particularly imperialistic political theology (which tended to correlate the Arianizing subordination of the Son to the Father with the subordination of the Church to the State). In the Historia Arianorum ad Monachos, Athanasius comments on the Emperor’s intrusions in very strong terms: “Heretics have assembled together with the Emperor Constantius, in order that he, alleging the authority of the Bishops, may exercise his power against whomsoever he pleases, and while he persecutes may avoid the name of persecutor; and that they, supported by the Emperor’s government, may conspire the ruin of whomsoever they will and these are all such as are not as impious as themselves. One might look upon their proceedings as a comedy which they are performing on the stage, in which the pretended Bishops are actors, and Constantius the performer of their behests, who makes promises to them, as Herod did to the daughter of Herodias, and they dancing before him accomplish through false accusations the banishment and death of the true believers in the Lord” (History of the Arians, NPNF-II 4 at 289). Drawing out some of the characteristic elements of the early Church’s reaction to whatever subordinationist impulses of a secularizing nature may have existed on the part of the State could be very helpful in deconstructing some of the prevalent contemporary preconceptions concerning the historical development of Church and State relations.